High-performance power in a benchtop centrifuge. Providing the performance of floor-standing instruments several times its size, the Allegra 64R is a benchtop centrifuge specifically designed for high speed separations. 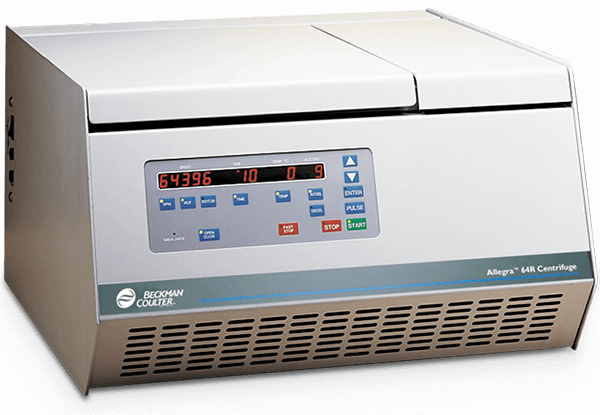 Providing 64,400 x g (30,000 rpm), the Allegra 64R is ideal for subcellular fractionation, protein isolation and purification, viruses and phase extractions. Features 64,000 x g (30,000 rpm) with fixed-angle rotor; Spin tubes from 0.25 up to 85 mL; Operating temperature from 2° C to 40° C; Rotors certified by Porton Down UK for Biocontainment.